Issue for Jan. 9, 1976 called v.4, no. 27 but constitutes v.5, no. 1; issue for July 7, 1989 called v.18, no. 11 but constitutes v.18, no. 13.
ing his first six-year term in the VS.
day Jan. 22 at 10 a.m. on Ch. 12. 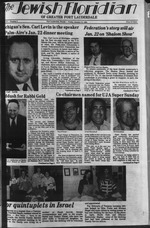 Jewish Federation over the years. fe?^ rlgl.!*. -. to the coup*. and elsewhere in the world. Center, now Temple Beth Am. ture at 7205 Royal Palm Blvd..
School to the rear of the Temple. rael, will be featured on the Jan.
manager of Bank Leumi le-Israel, which sponsored the dinner. He has been responsible for major u.
hk const icntious and intelligent work as a law. Sacks, Sam Schwartz. Milton Trupin, Pan! in advance, in the privacy of your home or office. fund your prearranged funeral in advance. supplied and paid for whenever needed. roe quardian plans program offers Insurance Funded or*rr.n.~ ___. Insurance Funded Prearranged F^aip" am. stork journey Sunday Jan. 29.
omptly at 5:30 p.m. that day. federation building at 8358 W.
rean Mile in Fort Lauderdale. narily open from 10 to 6 p.m.
owing that Sunday night Jan.
iseum to catalogue the objects. countries between 1948 and 1950.
be enriched by the exhibit"
Mrs. Levy and her husband. and Harry Shiller to be honored. Danny Tadmore will speak here. h? ?2n*' P******* for the Jan. 22 and Jan.
Padek; Maxine and Al Stein. second one on Jan. 29. Center at 6501 W. Sunrise Blvd. Jewish Center, 9101 NW 57th St.
ing and entertaining. Jerry Kaye. held st the home of the Lerners. what pleases the Reagan Administration. they saw it, is good for Israel. whether they want it to or not. and judged guilty of the crime the following Aug. id. wanted to go to his grave in peace. filthy, perverted Jew of New York." On Dec. 22,1983. only two weeks ago. Georgia1! dam iXINCSrri SI, Miami. Fla M1M Ft.ooa137J.4aW "'"
something akin to a resolution. yet not exactly like it. in Beirut on Oct. 23.
him to hold his peace. words, people simply ran away. WO s. Or are they? as in the 1928 failed campaip"
demonstrate to nns. *>l **! was a political entity. *"
then of Floral Park, N.Y..
dore Herzl died July 3.1904. Flax is an inveterate letter writer. Howing the release of U.S.
fald arrived in Beirut on ^ lfl83, th" kmmt numb,r m represents s drop of 98Ipsrc. Secretary of State for Human "^E^wlLmSbv*bmins. Rights and Humanitarian Affairs numbers rstaassd by ADrams. /. K. WEINRAUB & Co., Inc.
2000 City Hall Dr.. LauderhiU. City Library will meet at 7 p.m.
day Jan. 18 and 25. Call 474-5880.
and Moshe Waldoks at 1 p.m.
going world affairs at 10 a.m.
the value of antiques at 7:30 p.m.
Oakland Park Blvd. Abraham J. The shalom show Is funded, in part. 8358 W. Oakland Park Blvd. years old Saturday Jan. 14.
ber Leadership Mission to Israel. ty's Hollywood and Los Angeles. being memorialized at 2 p.m.
National Fund of Broward. Dr.
1965 through 1981 ... JNF. land Park Blvd.. phone 561-4812. Concord Hotel in the Catskills. Jan. 15 Happy Hour ("hour?" Graenxweig. That's at 8 p.m.
Jan. 18 at Pine Island Ridge. Tamarac Chapter at 1:30 p.m.
Jan. 19 at Tamarac JC. Sam Tamir and Jack Kohn. open a Broward outlet soon . rabbinical students in tat . All Publix Bakeries open at 8:00 A.M.
lie Monday Jan. 23 when Prof.
specialty food section of your favorite supermarket. p.m., Temple Beth Am, Margate. Jewish Center Men's Club: 9 a.m.
CONDO UJA RALLY: 10 a.m.
State of Israel Bonds: 830 a.m.
Temple Beth Torah: 6:45 p.m.
Circle of Yiddish Crabs: 10 a.m.
lunch Noon. 1 p.m. masting. tury Village Chspter: 12:30 p.m.
ter. Wine and cheese $3.50. Golds Meir Chapter: 1 p.m.
Whiting Hall, 6767 NW 57th St..
house, members $14; others $16. Post and Auxiliary: 7:30 p.m.
$25. Shirlee and Group entertain. Polynesian Gardens UJA: 7 p.m.
2 Meals daily included fi^fi *"
By Fran Rasumny Barrett, JJ). Q. My wife has a regular^. ting her an electric out. fill out a detailed form. January 21. 1M4 1:30 pm 4:30 p.m. Contact: owner Director Morgan I. levy. C.C.D. A Well Balanced Summer Program. gion, as speaker from 1 to 3 p.m.
local, state and national issues. by games at 7:30 p.m.
Gold Coast Section 11:30 a.m.
at Temple Beth Am, Margate. Club on State Rd. 84.
increased from 300 to about 2500. Annette Kay to co-chair the Jan.
l/we wish to contribute $. the Cantorlal Tribute Concert on January 22,1084. My check in the amount off----------------la enclosed. at 6 p.m. followed by dinner. presented at 8 p.m. Sunday Jan.
Steiner. Bruce Syrop, Ed Kourt. by Ronald (' Chalker. at 8 p.m.
Saturday Feb. 4 at the Temple. 1099 Pine Island Rd.. Sunrise. B not Mitzvah at the 8:15 p.m.
youth all over the world. " Bar Mitzvah during the 5 p.m.
Lucas Barnett. son of Ms.
at Temple Beth Torah. Tamarac. at Temple Beth Am. Margate. came a Bat Mitzvah at the Dec.
At the Saturday morning Jan.
7 service at Ramat Shalom. rid., he h won aw. pm Saturday lim.lpm, Sunday am., I p.m BaaM Pta! TEMPLE SMOLOM tStlAtiO). US BB lit* A**.. . Dairy I St a-aa. I:M p.m.
FrMaTZift. r* L*k*" Oondo O-bkouaa. SBM Bauty Rd. ft"
'caa. woman. Tuaadaytlp m BakM AraaUakarmaa. ^"wrhFrtdavTaJ ***- rtort Laudardala MU ***> *"
[Israel Independence Day, May 7]. jujb New York, new Vork I0OIO- "
Inium. "All the stories of the Golem . luiulge in lively, cozy emotions on his behalf. fid addresses the same age group, 12 to 14.
; a digger of graves. ward the end on "Miracle." them, just as among adults. A helpful glossary of terms is provided. Trigor of the Consulate in Miami. director, was a special guest. rael in a year and a half. distributes its money to the Jewish Agency in Israel the Joint Distribution Committee, HI AS. handicapped persons, strengthen life in Israel. ition of the Jewish homeland. ORT for schools in Israel and worldwide. clinic in Bulgaria ... a food kitchen in Warsaw. Immigrant Aid Society), founded in 1880.
care center for frail elderly, supervised by s qualified staff. Broward Midrasha for Adult Education, the Lecture Series. loellteinstein, General Chairman Brian ShmCo^L.